Ariana Grande is kicking off her Sweetener tour on a sentimental note. The singer commenced her tour in Albany, New York Monday night. Moments before the show at the Times Union Center, many fans shared on social media that some Mac Miller songs played in the background as fans eagerly awaited for her to take the stage. The 25-year-old has paid tribute to her ex-boyfriend a number of times ever since his sudden death on Sept. 7 at the age of 26 from mixed drug toxicity. About two months after his death, she covered up a tattoo that pertained to her ex-fianc Pete Davidson with one about Miller. The ink on her foot was changed from "8418," which was Davidson's father's FDNY badge number, to one dedicated to the rapper's dog named Myron. She also got some new ink on the eve of her big show and explained she wasn't covering up another Davidson-related tattoo, but rather she was "just evolvin." One of her most open and vulnerable homages to her ex was in her hit single "Thank U, Next," which later became the title of her newest album. 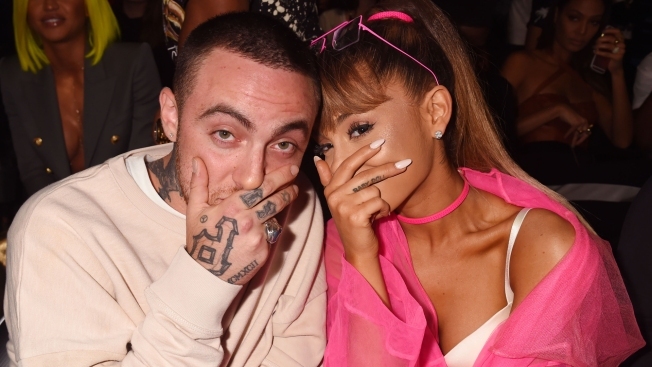 She sings in the first verse of the song, "Even almost got married / And for Pete, I'm so thankful / Wish I could say, "Thank you" to Malcolm / 'Cause he was an angel." Many of her fans believe a large number of her songs allude to Miller and their relationship, including "Imagine." Miller had a song called "Cinderella" and she seems to refer to some of those lyrics in a few of her own songs on Sweetener. The "Self Care" rapper was posthumously nominated for his first Grammy this year for Best Rap Album, although he lost to Cardi B.